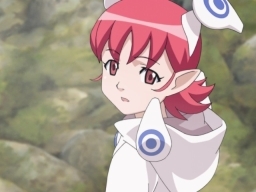 In the beginning, there was Phantasy Star Online, and it was good. A simple hack and slash dungeon grind that mangaged to be insanely addicting, as well as being one of the first online games ever, back in 2001 when the list was limited to like, Everquest, Ultima Online, and Diablo 2. After many years of PSO though, and many small half assesd updates that never added a whole lot to the game (version 2, Episode 2, Blue Burst), PSO grew stale, and we began to wait for a true sequel. After the after three years of waiting, Phantasy Star Universe arrived. And it... sucked horribly. I've already said more than enough about how much I disliked this game, so let's move on. 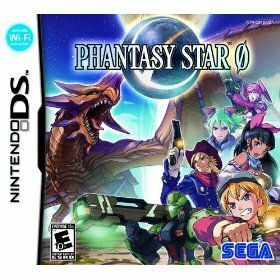 After this disappointment, I was pretty skeptical when Sega announced they'd be making a new game called Phantasy Star Zero on the Nintendo DS. The DS seemed like a very odd system to make an online RPG for, and I didn't trust Sega to make anything worthwhile after PSU anyways. Luckily most of these worries were unfounded, and Zero turned out to be a fine little game. The first and most important thing that Zero does, is use Phantasy Star Online as its base, and removes almost all of the retarded things that Universe tried to add. Zero just tries to be a straight up action game and does great at it, and doesn't try to force any of the annoying MMO wanna-be stuff Universe did. 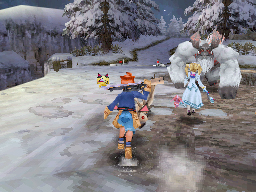 Gameplay in Zero is pretty much a standard 3D hack and slash, nice and simple. Run into a room, kill all the enemies, then move onto the next one. Since the DS isn't the best system for 3D, each room is separated from each other by a brief loading screen. While this is a bit disorienting at first, what it does allow is for all the maps to be randomized. Each area will never be exactly the same twice, which is very nice given the repetitive nature of the game's predecessors. In your quest to destroy as many enemies as possible, you can be one of 3 primary classes, Hunter, Ranger, and Force. Hunters primarily use melee weapons to dish out the damage up close, Rangers use guns, and Forces use techniques (basically magic) to not just lay the smack down on enemies with pretty explosions, but also heal and buff teammates. 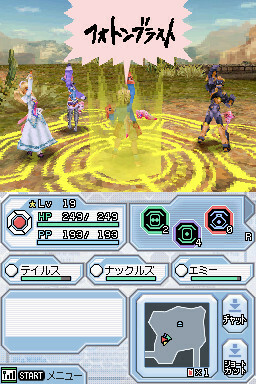 One of the strangest changes from previous Phantasy Star titles though, is that Forces are now very competant with melee attacks, which makes them seem a bit overpowered. Rangers, on the other hand, seem a bit underpowered. Not just because of their lower strength, but their overall lack of crowd control. Rangers focus on taking each enemy out one at a time, rather than cutting down an entire crowd at once. Whichever class you pick though, the game is still pretty easy regardless, so you can just play whatever you enjoy without having to worry too much. While I do feel the game is easy overall, you won't be thinking that the first time you reach your first boss. Like other bosses in the series, they require a lot of strategy in how you take them on. When initially learning their movement patterns the first few times you fight them, they can seem hellishly difficult. After a little practice, and gaining some levels, they aren't so bad. One key move to taking out bosses, is the new dodge roll, which allows you to quickly roll out of danger's way and become invincible for a brief moment. I didn't find this to be too useful during the stages against most fodder enemies, but against bosses, learning when to roll can easily be the difference between life or death. The roll is definitely a welcome addition to add a little more strategy to the game. The controls in the game are simple, but may take a little getting used to for new fans of the series. Actions you want your character to perform can be set to three of the face buttons, and holding R will give you another set of moves for a total of six. This may sound like a lot, but with light and heavy melee attack, dodge roll, a plethora of techniques, and items at your disposal, it can be very hard fitting everything you want on at once. For some reason the X button is reserved for menial tasks like picking up items rather than giving you an additional two spots for attacks. On the plus side, certain attacks can be charged up to change their behavior. Charging up a physical attack for a few seconds will let you unleash your weapon's Photon Art, basically a high damage specialized attack, and one of the few good things this game lifted from PSU. 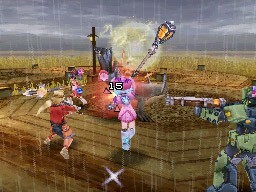 Techniques can also be charged up, generally turning them from single to multi-target attacks or buffs. Phantasy Star Zero has seven major stages, which is a pretty nice number given the original PSO had only four. Each of these seven areas had two primary segments that don't look exactly the same, as well as a unique looking midpoint room, some of which are gorgeous. The amount of scenery in the game is quite a high point, as even with the game on DS, they really pushed it to create some nice looking areas. The last two, Arca Plant and Dark Shrine are particular standouts for me. Even if the system isn't the strongest, the art design really shines through here. While the areas themselves are great, with so many comes one real problem - enemy variety. A few of the stages don't suffer from this, but some, most notably the final two I just mentioned, Arca Plant and Dark Shrine, only have 3 different enemies the entire stage. So while these stages are gorgeous to look at, they're a bit tedious to play, which is a shame. A few more types of enemies would've gone a long way, as each stage only has one unique type of really difficult enemy, the rest are really just weak fodder for you to plow through. The original PSO may have only had four stages, but it was definitely a case of quality over quantity. One area where Zero doesn't let down though is the music. The soundtrack is very atmospheric and definitely gets you in the mood for the game. 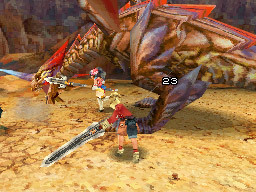 Returning from PSO is the dynamic area music, where the music will change and get more intense when enemies are around, and then fade out to a more subdued track when everything is dead. Doing this really helps the music not get annoying and repetitive. In addition to the stage music, there are also the usual boss, town, and story mode music tracks. The soundtrack released for the game filled 3 CDs (and a fourth CD for arranged versions) so it's worth playing with headphones on to hear the music through something other than the crappy DS speakers. Hey, Story mode, I haven't talked about that yet! Story Mode is the offline mode of the game, where you create a character and get followed around by some very (and I mean very) chatty NPCs. The dialogue is passable, some of it is pretty cute, but at times the excessive length of some dialogue scenes can get a bit tiring. The basic story of the game is that Earth was nearly destroyed 100 years ago and humanity is barely clinging to life and rebuilding, but evil forces are out to destroy any progress they've made. The story changes depending which race you pick for your character, but it's all pretty much the same in the end. There are a few animated cutscenes, but besides the intro movie, they're all around 5 seconds long and nothing to really write home about. Story mode basically follows a very linear format, clear a stage, talk a while, repeat. With only 7 stages, story mode isn't very long, but I do appreciate that it moves along at a brisk pace with each new chapter taking you to a new area, rather then having 7 areas be stretched out into 12 chapters like PSU tried to do. Overall it feels about just right to me since it's not the primary focus of the game. As you progress though story mode, and even after beating it, you unlock additional side missions for the areas you've cleared. These give a nice sort of "second loop" feel to the game, since after you finish story mode, you unlock the hard difficulty, and can then start the side missions and work your way though the areas again, but with new dialogue. I was disappointed in the variety of these missions though, as they always follow the exact same format of get to the end of the area and kill the boss. 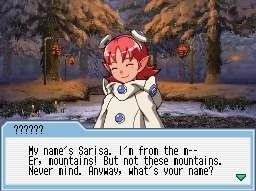 Even if they were annoying, Phantasy Star Online had some variety in its quests, like protecting an NPC, gathering items, or... ok so there wasn't that much variety, but it is still strange that every quest in Zero will always, without fail, end with the boss of the area you're in. Storyline wise, the last two quests are interesting because they take place after the end of story mode, and help answer a few lingering questions. But what about online play, which is pretty much the bread and butter of the newer Phantasy Star games? Well, it's pretty good, but on the other hand, could have been a lot better. At the very least, you won't be running through the same one "hot spot" mission until your brain explodes like in PSU. Like every other online DS title, Zero suffers greatly under the friend code system. 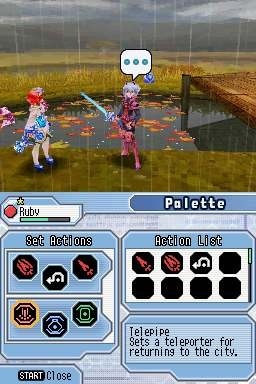 If you've played PSO, the way friend code games works shouldn't be very surprising. One person hosts a game, and anyone who has exchanged codes with them can join. It's simple enough, but since there is no game lobby or communication system, you'll have to be finding other ways to chat with your friends when you want to meet up for a game. Once you're all in the game playing together you can send messages to each other by writing them on the lower DS screen, which is just about the most annoying method of talking ever, or at least it is for me since I have horrible handwriting and can barely fit four letters on the lower screen at once. I don't find it particularly useful besides writing very basic things like "OK" "BRB" "Here" or drawing something simple like an arrow, smiley face, or male genitalia. Heck, even an onscreen keyboard that you typed on with the stylus would've been easier. Luckily friend code games are not the only way you can play online, so anyone without friends, fear not! There is also the free-play mode, where you pick a stage you want to play, and the game pairs you up with people who are also looking to play the same areas. However since this is Nintendo online, you aren't allowed to talk to anyone, only choose from a list of pre-set phases. Ironically enough, you can't use these in the friend code play, which would've been nice. 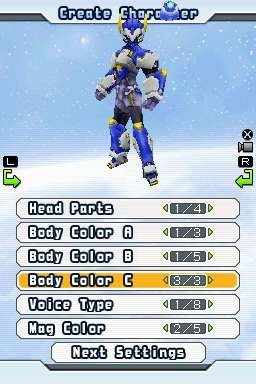 They do the job well enough since this is a fairly simple game, but it's nowhere near the depth of PSO's pre-set chat selections which allowed you to create basic sentences about nearly every subject that could possibly happen in game. The selection of phrases like "Hello" "Great" "Let's go!" is pretty small by comparison. The selection is so small, they forgot some pretty important things, like any method of saying goodbye when leaving a game. The biggest annoyance in free-play mode though, is how once you finish the stage, there is no way to choose a new one or even repeat it. Everyone has to exit back to the menu and search for a new free-play team which can take several minutes. This is a pretty big annoyance, and kind of wish the game had gone for a lobby/leader system where one person would be given permission to select new areas, though that might be difficult without anyone being able to talk to each other. One of the best things about online play is how item distribution is handled. Offline you don't have to worry about being an item hog from the NPCs, so what about online? Zero finally solves this problem in a brilliant way. Every item you see on your screen is yours. 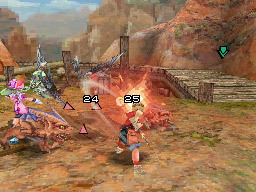 Every enemy still drops one item, but each player sees something different, so in essence each enemy is now dropping four items in a four-person game. 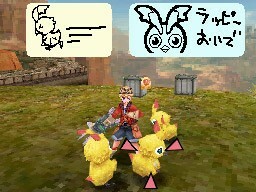 Previous games in the series had issues with players wanting to play alone all the time when hunting down a rare item, but with this system it becomes better to play with other people and mow down enemies faster. One issue I have with the game though, is just how easy it can be at times. There wasn't that big of a jump in difficulty between normal, hard, and super hard difficulties. Instead of the enemies getting significantly faster, they only really have jacked up stats. They hit harder, take more hits to kill, but they're still the exact same enemies as before. The fact that super hard felt just like hard mode, only you take more damage when hit, was a pretty big disappoitment. One last thing I should mention, there are actually eight areas. The final one is offline only, which is just about the dumbest thing you could possibly do in an online team-focused game, put in content that is available only when playing alone. The eighth area is known as the Eternal Tower, and it's 101 floors of absolute fun. Every room spawns 1 wave of enemies, then you move onto the next, and repeat, repeat, repeat. Each floor is 7 rooms long, so this bad boy takes a very long time to climb. Even if you're killing the enemies instantly, expect to spend several hours simply running your character to the top. I wouldn't have such a problem with this area if it was jammed packed with enemies, but spending so long running through empty rooms is just mind-numbingly tedious. So why bother with such a boring area? Because they damn near made it required. To unlock super hard difficulty offline, you have to clear the tower on hard. Which I guess makes sense for players who are 100% offline only, but it's a huge pain if you also play online and really don't want to bother. Unlocking super hard offline also comes with the wonderful prize of unlocking the super hard tower. And in super hard tower, nearly every rare item in the game is capable is dropping, including a few that only drop there, making it a pretty much 1 stop shop for rare hunting. Which is another horrible move to make in an online game, making every single item drop in one area that's offline only. Brilliant! Overall though, even though I nitpick on the flaws a lot, Zero is a damn fun game. It's a nice return to form for the series after the disaster that was Universe. It's just a lot of fun and you'll quickly find yourself wasting many hours grinding levels, hunting down rare items, and raising mags (yeah I never mentioned them, go play the game and you'll find out!) At the same time though, it's hard to call it a successor to Phantasy Star Online, as it doesn't really add much new to the formula, but is a bit watered down in almost all areas, most notably the online portions. Zero is a good game, but it could've been a great game, if just not severely limited by being on a handheld system. But for those who are nostaligic for PSO, and hated PSU, this one is surely worth a look.